Current Employer: Enterprise Networking Solutions Inc. I first started using VMware Workstation and ESX in 2005 while working at JTS Communities as a Network Administrator. As I worked with ESX and saw the isolation/encapsulation capabilities I could see just how disruptive virtualization would be for the technology industry and that it would enable and usher in so many new capabilities that were either very difficult and/or costly to implement and manage. I also liked the fact that in order to do virtualization well it would require me to be well rounded in Server Operating Systems, Networking, and Storage as well as virtualization itself. I liked that challenge and saw this as the career path I wanted to target. So I then looked for employers where I could design and implement virtualization solutions or where I could manage and administer large and complex virtual environments. 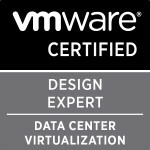 I started in November of 2009 taking the VMware Administrator and VMware Design exams (now the VCAP-DCA and VCAP-DCD exams). VMware was still working out kinks in the communication process for how you were enrolled for those exams, and then getting back to you on when you could schedule the next step. I then took the first VCDX Boot Camp at Partner Exchange in Vegas in 2010. I sat in the back of the room and started to soak in the information. I ended up sitting next to Frank Denneman (VCDX#29) and he was giving his VCDX defense the very next day. He was SO gracious and helpful pointing me in the right direction giving me a heads up that I would need to spend a good deal of time and attention on the application and design documentation. I then ended up filling out the application and augmenting and providing the necessary required documentation from my real world design in May and submitted all of that information right before the deadline (Like I think I maybe had an hour to spare). That was really the most gut wrenching part of the entire process, and in my opinion the most difficult. I got the thumbs up that my application and documents had been accepted and that I would be defending my design the Thursday before VMworld. I then spent the remaining time till then reviewing my design and based on the advice from the VCDX boot camp, going over not only why I had made certain design decisions, but also why I chose not to make different design decisions. Was it because of a constraint, a customer requirement, or perhaps even preference towards a certain hardware vendor on the customers end. For me, the defense, while nerve wracking, was not actually the most difficult portion of the entire process. I am pretty good at thinking on my feet, I have excellent communication and soft skills, and I’ve had plenty of experience delivering designs and doing presales sessions in front of customers. Doing the defense was really no different. I just had a VERY well educated and technical astute customer. It was nice to be done with the defense and enjoy VMworld, but it wasn’t till almost a month later that I got the e-mail with the good news. First off, the VCDX isn’t for everyone. It really is for those that are currently VMware design architects or that aspire to that kind of position. This certification is really geared for folks that understand how to take a customer’s business requirements and can turn that into a technical solution given all the potential risks, requirements, and constraints for that particular customer. If you do feel this is the right path for you then I first of all recommend that you use a real customer design. Even though a fictitious customer is acceptable, it will drive you crazy having to create from scratch a whole customer scenario (this would be analogous to the work of J.R.R. Tolkien coming up with the entire history of Middle Earth, legends, the Elvish language, etc. – you don’t want to really do that unless you’re a glutton for punishment). Another item of advice is to make sure you’ve given yourself enough time to put together the application and documents. Don’t put it off or procrastinate. You’ll be sorry if you do. Also, keep your design simple. Your design doesn’t have to be a 500 page multi-site international design complete with VDI, every hardware vendor under the sun, etc. The cleaner and simpler you can make your design, the better off you’ll be. Don’t hand in a five page design doc – that would also be hurtful to your chances of passing. But remember, you’re gonna need to know this design like the back of your hand when you give your defense, so do yourself (and the VCDX application review board) a favour and keep it short, but also complete (DO NOT leave out anything that they ask you in the application to have included in your documentation). And finally get peer support. Get advice from folks on twitter or the community forums. Have people review your design and folks you respect watch your mock defense sessions. Have given myself more time on the application and design documentation. Life is good. I feel truly honoured (and still quite shocked) to be in the company of some truly amazing people. I actually ended up changing jobs weeks before I found out if I had gotten the VCDX. But that was really just a chance for me to move back home from Kansas to Northern California. That in itself has been a true joy. I’m working at a small integrator out of Sacramento, CA and I have the privilege to work alongside some truly fantastic peers. I know I could have my pick of several great opportunities out there, but for now, the ability to stay close to home with almost no travel allows me to spend quality and quantity time with my son and daughter. Categories: Certifications, VCAP, VCDX | Tags: spotlight, VCAP, VCDX, VCDX5, VCP, Virtualisation, virtualization, VMware | Permalink.